March | 2019 | SessionLinkPRO - Professional far end recording through your web browser - more than an ISDN replacement / ISDN alternative! By popular request, we have added a new routing option to the “dual mono” mode. If activated, “bridged” allows the two guests to communicate with each other. Full signal separation at the host is preserved for recording both guests on dedicated channels. The “Record” feature now allows to record both, local and remote signals, at once. Of course with full signal separation. Again, a popular user request turned into a new feature: we have added a group chat. The SIP client now comes with an additional dial pad. For example, it comes handy if you need to enter a pin code for a phone conference. 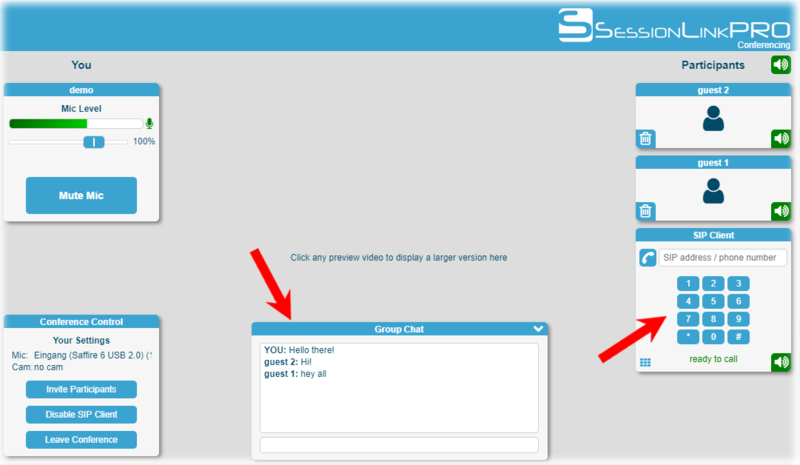 We have added Firefox support for SessionLinkPRO | Conferencing and SessionLinkPRO | Video. Please note: this feature is in beta test, so no guarantee!